Kickboxing: This is a great workout (with or without a punching bag). 20-30 minutes of punching and kicking can burn hundreds of calories. Keep your feet moving to keep your heart rate up. Yoga: For most yoga workouts, you simply need your two arms and two legs. It is one of the easiest and natural workouts to do at home. There may even be workouts OnDemand (or definitely YouTube) so you dont' even need to go out to purchase DVDs. 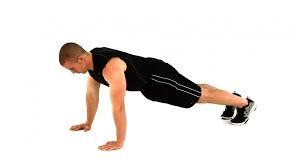 Strength Training: You can use your body weight by doing pushups. Or you can get creative and fill a half gallon container with water and do curls. For a small investment, you can get dumbbells and resistance bands. You can create your own 20 minute circuit workout in different areas of your apartment, and do lunges to get from one area to the next. Simple squats, shoulder presses and leg lifts can easily be done in small spaces. 10 Minute Abs: Nothing tough about situps, they can be done anywhere! There are tons of types of ways you can work out your abs, from normal crunches to reverse crunches to twist crunches. For a killer ab workout without any extra equipment, try an alternating side plank: Start in the plank position. You should look like you are ready to do a push up, with your body aligned, next straight and feet together. Rotate your body to your right into the side plank position, balancing on your right palm and the side of your right foot. Extend your left arm up and hold for three seconds. Return to central push up position then repeat the process on your left side. After 20 reps you’ll be begging for a break! *Most of our gyms are open 24 hours a day, or at least for extended hours (5am-11pm), so if you need to get up super early or go right before bed, they are open!